A decade in the planning, Middleton has devised a cost-effective, secure, members-only referral and recommendation tool with the aim of helping businesses flourish. Working at the Templeborough precision manufacturer, Vince rarely had time to network - or make connections via the thousands of business cards he had amassed over the years. When he wanted to find a specialist for a job, he had to wade through his drawerful of cards, or call trusted contacts for recommendations. The business development tool aims to unlock opportunities and prevent missed opportunities. It is fired by traditional business values Vince believes should not be lost - trust, honesty and having the generosity of spirit to blow the trumpet for people whose work you value. 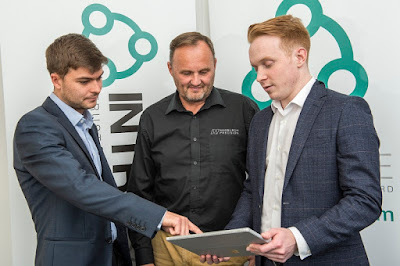 Vince Middleton, founder of IntraSale (pictured, centre), said: "IntraSale members don't sell themselves or tout for work; via the site they put forward the best people they know to contacts who have a job they need doing. "If a client needs a service I can't deliver, why not recommend them to the likes of Forgemasters? It gets me credibility, solves a customer’s problem and brings business to the SCR [Sheffield city region]." Two other highly-regarded business names in the SCR have thrown their weight behind the scheme with personal endorsements. Professor Keith Ridgway, founder and executive chair of the Advanced Manufacturing Research Centre (AMRC) in Rotherham, and Alan Lyons, founder of networking group Lyons Den, have invited hundreds of their contacts to join. Vince anticipates referrals amounting to over £1 billion within the first five years. He believes the site has potential to go global and eventually rival both LinkedIn, which he claims is now awash with recruiters and self-promoters, and one-seat business groups whose members do business solely with each other. Since the soft launch in April, over 230 businesses have signed up, including universities, property developers, accountants, lawyers, engineering companies, surveyors, a print shop, painter and decorator and a beauty company to name a few. Middleton added: "My sector is engineering and manufacturing but this platform is for anyone in business. We want tradespeople and professional services, digital and creative industries to benefit too." IntraSale has already led to work being won via recommendations from a number of members. IntraSale itself used the platform's Call Out section to find endorsements for a design company for its marketing banners and a PR team. The platform needs to grow its database and more businesses are being sought as founder members, for a £99 one-time fee, by June 30. Afterwards the cost will be significantly more. Vince originally wanted to create IntraSale in printed form and in 2008 approached regional authorities and business support organisations, to no avail. The idea went on the backburner until he crossed paths with software developer Sean Maloney who has since developed the complex software and interactive platform and is still involved with the running of IntraSale while also heading up his own start-up, Tower DMS. IntraSale membership fees will be ploughed into job creation and further software development to ensure it is a worldwide success. Sheffield Hallam graduate Felix Barr is in place as business development manager and a graduate systems manager and a digital marketeer are being sought.